Box Text: Train That Brain! Exercise is the key to good health, both for body and mind--and now there's finally a way to make mental exercise simple and fun. Inspired by the work of prominent Japanese neuroscientist Dr. Ryuta Kawashima, this software features activities to help stimulate your brain and give it the workout it needs. Using it for just a few minutes each day can make your brain feel fresh and sharp! 01-27-2016 aliensstudios Box Text Train That Brain! Exercise is the key to good health, both for body and mind--and now there's finally a way to make mental exercise simple and fun. 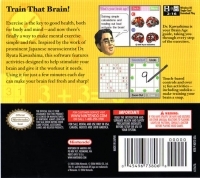 Inspired by the work of prominent Japanese neuroscientist Dr. Ryuta Kawashima, this software features activities to help stimulate your brain and give it the workout it needs. Using it for just a few minutes each day can make your brain feel fresh and sharp! 12-16-2012 invis Box Text Train That Brain! Exercise is the key to good health, both for body and mind--and now there's finally a way to make mental exercise simple and fun. Inspired by the work of prominent Japanese neuroscientist Dr. Ryuta Kawashima, this software features activities to help stimulate your brain and give it the workout it needs. Using it for just a few minutes each day can make your brain feel fresh and sharp! 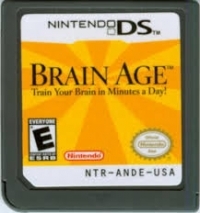 This is a list of VGCollect users who have Brain Age: Train Your Brain in Minutes a Day! in their Collection. 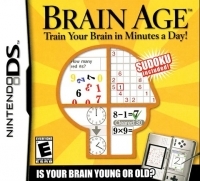 This is a list of VGCollect users who have Brain Age: Train Your Brain in Minutes a Day! in their Sell List. This is a list of VGCollect users who have Brain Age: Train Your Brain in Minutes a Day! in their Wish List.